Southwinds Resort & Marina is located at 94 Front Street East in Bobcaygeon, Ontario. Southwinds offers beautiful one and two bedroom suites, deluxe housekeeping cottages, excellent docking facilities, and easy access to some of the best fishing in Central Ontario. Southwinds Resort is close to Lock 32 on the Trent Water System between Pigeon Lake and Sturgeon Lake. Located in the "Hub of the Kawarthas"
Bobcaygeon has been affectionately dubbed "The Hub of the Kawarthas" because of its central location. 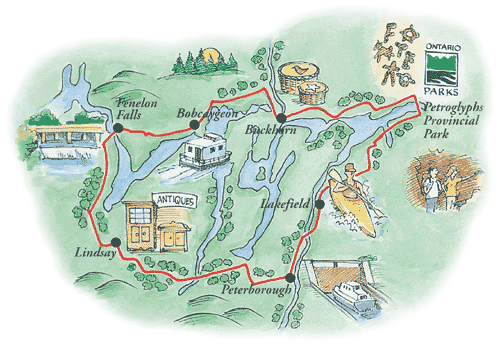 Bobcaygeon is just 36 km north of Lindsay, 59 km north-west of Peterborough, and 166 km north of Toronto. Many Torontonians own or rent cottages in and around Bobcaygeon, which is only a pleasant two-hour drive from Toronto, Ontario.